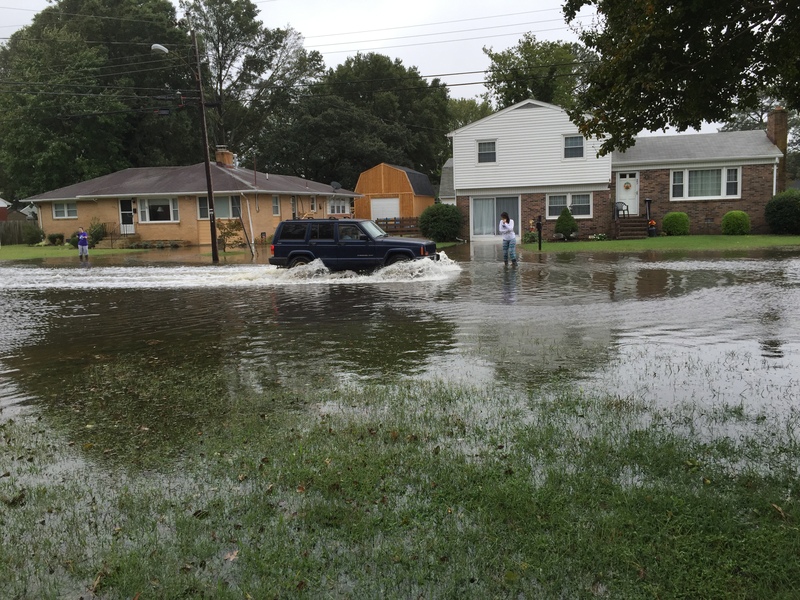 Everyone who lives in Hampton Roads has witnessed cars driving though high water during floods. Most people know that salt water, or brackish water, can cause damage to your car. However, during some of the worst floods there exist a group of people who like to drive through the water for fun. The problem comes because these cars cause wakes in the water. When high flooding is occurring in neighborhoods the water often comes right up to peoples doors. Vehicles wakes can force water into structures. There is no just a little water damage in walls during a flood. If water gets in your walls, they have to be cut out and sprayed for mold. If you don’t, the mold can grow and make the occupants very sick or even die, as happened to one of my elderly neighbors. The police cannot do anything about the wakes, as usually the roads are not closed. In Hampton, at least, the police would spend a considerable amount of time just closing roads. Then they could not station someone there to watch for people driving around the barriers causing damage. So the homeowners are left standing on the side of the road, trying to get people not to drive down flooded roads. In our neighborhood at least, this has not been successful. However, you have approach people in a non-antagonistic way in hopes of getting them not to continue driving down the road. My neighbor stopped one person and asked him if he was not worried about his car. The man said “Oh its ok I do this all the time.” When my neighbor and I stopped another person and told him he was making waves, he said, “ I am checking on my grandfather.” The problem with that was his grandfather lived at the other end of the neighborhood that did not flood. He did not have to drive deeper in the neighborhood. When confronted with this fact he started laughing and spinning his wheels causing the biggest waves possible. This is not a new trend and has been happening since my neighborhood started flooding after Hurricane Isabel. People in my neighborhood know to get their cars and older relatives out before the flood. In the rare case where it floods and they cannot wait out the storm, they walk into the neighborhood. Even slow moving cars can cause wakes. Recently, I approached Hampton City Council and suggested an ordnance to that I think will help with this problem. I would like to have a no wake zone on cars. The law already exists for boats. Hampton City Council unanimous agreed and proposed this ordnance in thier legislative package. Heres a link to the daily press story and a link to Wavy 10 story. This has been a frequent problem and this would allow the police to ticket someone causing damage due to wakes. This month the City of Poquoson City Council also agreed unanimously to back the ordnance with the City of Hampton. This issue affects Norfolk and Portsmouth also. I would hope the City Councils on the Southside would support this bill. With the passing of the bill in the General Assembly this year, homeowners would have help against people who’s fun is causing them thousands of dollars.